Les Parsons started Menai Sea School in 1998 a RYA Training Centre based on the glorious Menai Straits providing RYA Practical and Theory Courses. The Principal Les an RYA Yachtmaster Instructor/Examiner including Ocean, RYA Diesel, Radar, and SRC Assessor. Ali a RYA Yachtmaster Ocean, Cruising Instructor, RYA Diesel, Radar and SRC Assessor. Since 2002 the school has only provided theory training inconjuction with high latitude sailing expeditions, visiting South America, Patagonia, Falkland Islands, Arctic Norway, Faroes, Iceland, West Greenland. Currently Alaska. Great new website, hope to join you soon for another adventure. Thanks for a great trip, really enjoyed it. 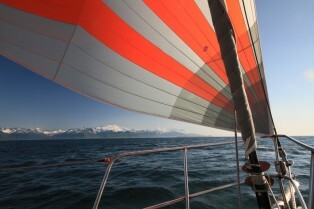 Hope to join you in Alaska for another sailing adventure. Keep up the good work, Arctic Tern UK is really looking good now.